This week is all about the Socks. No not those Sox.... The Dirty Sock Funtime Band. We have 4 free pavilion tickets to see these guys rock out at Ravinia on Father's Day. And we're extending our Free Ticket Tuesday give away till noon Tuesday instead of midnight tonight. So enter if you haven't already, and if you have, you can enter again with every documented social media share. We'll be announcing our winner shortly after noon tomorrow. Also, remember our drawing for their latest CD, Sock-A-Delic is open through midnight Tuesday with our winner announced on Win A Disc Wednesday. AT RAVINIA ON JUNE 19th! Beloved by millions of families for their high-energy music videos on the Nick Jr. channel’s Jack’s Big Music Show, The Dirty Sock Funtime Band will make a return visit to The Ravinia Festival, 200 Ravinia Park Rd., Highland Park for a show at 1:00 p.m. on Sunday, June 19th. This performance is part of the Kraft Great Kids Series. 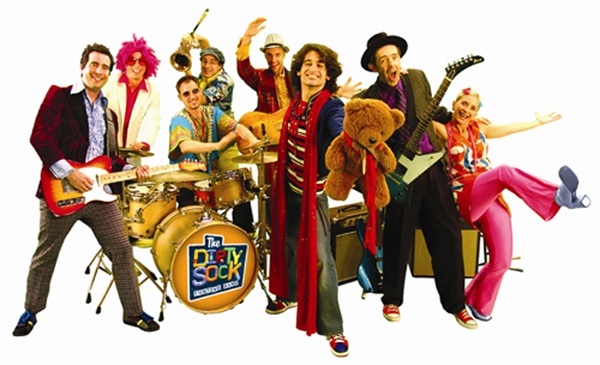 The outrageous popularity of The Dirty Sock Funtime Band is easy to understand from a kid’s point of view, for their shows are interactive spectacles involving rock band, dancers, comedy, and costumes. The band’s six-to-eight members really know how to fill the stage with action: it’s better than a three-ring circus. Each member has his or her own role to play and distinctive personality to project, but they all come together like clockwork. And what a sound! Their music is polyphonic to the max with melodic lines and supercharged rhythms weaving in and out like a Bach fugue or a great Dixieland band with everyone wailing on the final chorus. The action onstage is as fascinating as a perfectly timed basketball team. The stunning impact of this stage energy is balanced by the cleverness of the compositions and the smartness of lyrics that offer large words and large ideas, all seasoned with the band’s own brand of belly laugh comedy. The singing, the comedy, the playing, the dancing … it all fits together into one big kaleidoscopic thrill. The Dirty Sock Funtime Band lays down some serious talk when they say, "Come join the band." Everything about their show is interactive from the moment dancer supreme Annie Elmer invites the crowd to jump into a new experience. From there, the action builds, with band members popping up in the audience to share the mic with kids, “Mr. Clown” (Adam Jacobs) and Annie showing everyone how to do the "Donut Brain Alien,” Mike leading the crowd in a dance-off, Stephen Jacobs organizing a game of freeze dance, and Mr. Clown asking the audience for song lyric suggestions. At one point, the whole band collapses from exhaustion, and it's up to the crowd to make the right kind of noise to wake them up. Resuscitation takes the form of the song "Music Everywhere," an open invitation for audience participation. The show’s “eleven o’clock” number, “No Good Reason Party,” brings kids to a peaceful state of bliss that’s the calm before the storm of a family sized ROAR wrapping up the show. The Dirty Sock Funtime Band recently returned from their first overseas tour, performing for Navy families in Bahrain, Greece, Italy, and Spain, and they have shows scheduled throughout the summer and fall. The band recently released a new CD, Sock-A-Delic, and their first DVD, The Dirty Sock Funtime Band. The next Dirty Sock Funtime Band release, in fall 2011, will be an interactive e-book based on their song “Treasure.” November 2011 will see the release of an all-new studio CD. Check out The Dirty Sock Funtime Band’s website at www.dirtysockfuntimeband.com. As if that's not enough, The Kraft Great Kids Hoopla is going on from 11 a.m.-12:45 p.m. (concert begins at 1 p.m.) In this space families can enjoy Ravinia’s “instrument petting zoo” (an area where kids can try out musical instruments), storytelling with the Chicago Public Library, build an imagination playground with Kohl Children’s Museum and enjoy other activities provided by Chicago cultural institutions.